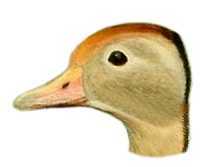 Build the black-bellied whistling duck box with cedar, pine or most any softwood. Use wood stock rough-cut on both sides to simulate tree cavities and so birds can grip surfaces. Make a 12″ by 12″ floor (inside dimensions) and 22″ floor to ceiling (inside front). Make an entrance hole 6″ wide by 4″ high located 19″ above the floor (to top of hole). Cut or drill ventilation openings in the floor and under the roof. You may prefer Side Opening Doors instead of hinged roof doors for duck houses. They are possibly more convenient and safer for other birdhouses as well. Some like to attach wire mesh on the inside front panel to help ducklings climb out of the box. If you do, bend the needle sharp ends over and fold behind. A better alternative may be to use plastic poultry or snow fencing, or similar material. Attach boxes for black-bellied tree ducks to metal (preferable) or to wood posts. Mount 4′ above water, 6′ if above ground, higher if it is likely to attract the curious. If above ground, locate near ponds and where vegetation provides cover for ducklings to travel to water. Always protect with 3′ wide cone predator guards around the post, under the box. Place 3″ to 4″ of wood chips (not saw dust) in the boxes. Remove everything from the box and clean well after the brood rearing season is past. Wood ducks typically nest well before black-bellied whistling ducks. It is possible that both might nest in a tree cavity or nest box in the same season. Black-bellied whistling ducks usually raise two broods in a season. Attach boxes for black-bellied tree ducks to metal (preferable) or to wood posts. Mount 4′ above water, 6′ if above ground, higher if it is likely to attract the curious. If above ground, locate near ponds and where vegetation provides cover for ducklings to travel to water. Always protect with 3′ wide cone predator guards around the post, under the box.